The second annual Tremaine Arkley Croquet Collection Prize is now accepting submissions. The $1,000 prize is awarded annually to the best research paper featuring the Arkley Croquet Collection. Research papers can focus on a range of subjects, including gender studies, athletics, history, art and photography – however, the paper must use the collection in some capacity. 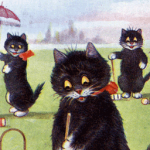 The Arkley Croquet Collection contains more than 1,400 items from the 1850s to 1950s. The collection includes oil paintings, watercolours, illustrations and fine art as well as photographs, prints, books, advertisements, comics and other materials related to croquet. The images show the rise in the game’s popularity in England and America in the 19th and 20th centuries. The collection also offers a fascinating glimpse at gender roles, as croquet was one of the first games that men and women played together. Tremaine Arkley, a former member of the US National Croquet team, and his wife Gail Arkley donated the collection to the Library in 2011. Researchers wanting to use the collection can view it in person at UBC Library’s Rare Books and Special Collections (RBSC), or online via the Library’s Open Collections portal. Submissions should be sent to the head of RBSC, no later than 4 p.m. on April 30, 2017. All UBC students are eligible for the prize. For a full list of requirements and submissions information, see the prize poster (PDF). Please direct questions to rare.books@ubc.ca. Prize winners will be announced in May. 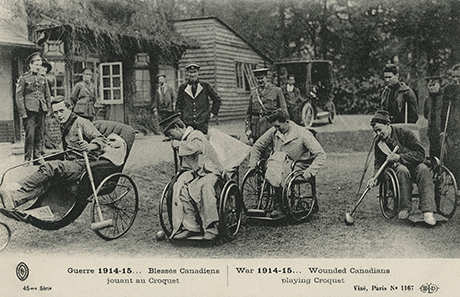 Wounded Canadians playing croquet, circa 1915.